…The Gauchos were very civil & took us to the only spot where there was any chance of water. — It was interesting seeing these hardy people fully equipped for an expedition. — They sleep on the bare ground at all times & as they travel get their food; already they had killed a Puma or Lion; the tongue of which was the only part they kept; also an Ostrich, these they catch by two heavy balls, fastened to the ends of a long thong. — They showed us the manner of throwing it; holding one ball in their hands, by degrees they whirl the other round & round, & then with great force send them both revolving in the air towards any object. — Of course the instant it strikes an animals legs it fairly ties them together. One day, as I was amusing myself by galloping and whirling the balls round my head, by accident the free one struck a bush, and its revolving motion being thus destroyed, it immediately fell to the ground, and, like magic, caught one hind leg of my horse; the other ball was then jerked out of my hand, and the horse fairly secured. Luckily he was an old practised animal, and knew what it meant; otherwise he would probably have kicked till he had thrown himself down. 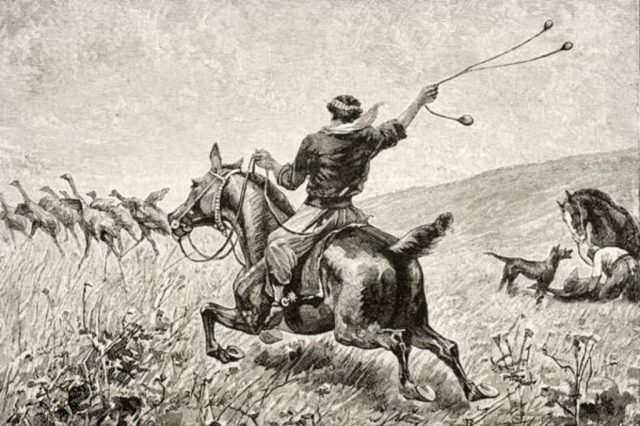 The Gauchos roared with laughter; they cried out that they had seen every sort of animal caught, but had never before seen a man caught by himself. Darwin brought his bolas home with him. They can still be seen on display at Down House.